Belly bloating and water weight may be show up as a high number on the scale and hard-to-zip pants, but they aren't a true reflection of your weight. Any number of factors cause bloating -- hormones, your diet, salt intake and a digestive disorder are several examples. Dietary choices and eating patterns as well as physical activity help reduce water retention and bloating. Bloating and water retention happen to just about everyone at some point. Bloating can occur due to a heavy meal that takes time to digest. Certain carbohydrates, particularly fibers and sugars, are hard for your body to break down. They're only partially digested as they pass into your colon, where gas-causing bacteria finish the job. Getting too little fiber leaves you constipated, which can create bloating. Getting too much fiber, especially when your body isn't accustomed to it, can also cause a tremendous buildup of gas and bloat. Not everyone's digestive tract is sensitive to the same foods. People who suffer from irritable bowel syndrome, or IBS, may bloat as much as 40 percent in a day due to digestive distress. Food intolerances, such as to lactose or gluten intolerance, may also cause bloating and water retention. Bloating often occurs during a woman's menstrual cycle due to the high levels of progesterone released during the luteal phase. This hormone throws off the water and electrolyte balance, but when progesterone drops again during the follicular phase, the water and electrolytes return all at once -- creating a sensation of fullness and water retention. Excessive sodium intake can also cause you to hold onto water and feel bloated. If you frequently consume processed foods or take-out, you may be consuming way more than the 2,300 milligrams recommended per day by the publication "Dietary Guidelines for Americans, 2010." 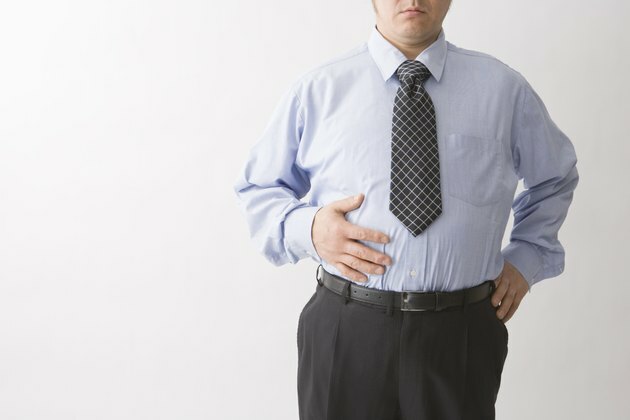 Sitting around and coddling a bloated belly does nothing to help the symptoms. If you've just eaten a large meal, are on your period or suffer bloating due to IBS, get up and move. Mild physical activity helps reduce gas in your digestive tract and the subsequent bloating, found a 2006 study published in the American Journal of Gastroenterology. Even a short 10-minute walk after a meal helps digestion, reported the New York Times in 2013. Enhanced digestion means the food moves through your system faster and doesn't contribute as much to bloat. Regular exercise also helps water retention and bloating caused by IBS. A 2011 study also published in the American Journal of Gastroenterology recommended physical activity as a primary treatment for bloating and other symptoms of IBS. Talk to your doctor about whether this might be an effective treatment for you. Bloating after meals means you may need to refine what you eat. Dried beans and legumes, onions, broccoli, cauliflower, mushrooms, artichokes, pears, apples, peaches, whole-wheat, bran, carbonated drinks, fruit juice and artificially sweetened gums and candies that contain sorbitol, mannitol and xylitol can all cause excessive gas in some people. Stick to easier-to-digest veggies, such as romaine lettuce and other greens, and fruits such as oranges and grapes, when you're trying to reduce bloat. A lower-fat diet can also help reduce gas and bloating. Fat doesn't cause your body to swell and retain water, but it digests more slowly, preventing food from moving quickly from the stomach to the small intestine. When you eat less-fatty meals, you digest more quickly so that food passes more swiftly through digestion. Cut back on dairy if you suspect your bloating is due to lactose intolerance. Lactose is the sugar found in milk and milk products. Cut dairy out for a week or two to see if it helps slim your tummy. Do seek out alternative sources of calcium, though. Canned fish with bones, tofu, spinach and fortified almond or coconut milk are options. Eating quickly causes you to swallow air along with your food, resulting in an abundance of gas and bloating. Put your fork down between bites and chew thoroughly to slow down. Drinking from a straw and chewing gum also cause excessive air swallowing that contributes to bloating. Eating smaller meals more frequently can prevent you from feeling overly full and bloated. You might try splitting your normal breakfast or lunch into two different servings, eaten an hour or two apart. Reduce your sodium intake to 1,500 milligrams per day, which qualifies as a low-sodium diet, to help minimize water retention. Use herbs, spices, citrus juices and vinegar for seasoning when cooking at home. Remember, little of the salt you consume actually comes from what you add yourself with the salt shaker. Restaurant food, take-out, frozen dinners and other packaged foods already have salt added, and they can be loaded with sodium even if they don't taste excessively salty. You may need to commit to cooking more at home and forego store-bought dressings and sauces to stay within your sodium limit. Getting 38 grams of fiber for men and 25 grams for women helps keep your digestive tract running smoothly. That's because fiber adds bulk to your stool. Not getting enough fiber can slow the transit of stool through your system and cause uncomfortable bloating. Too much fiber, or too much of certain types, can make you feel bloated and gassy, too. If you suddenly increase the amount of fiber you're eating, your digestive system may create more gas as it struggles to digest the more complex substances. Over time, your body becomes more efficient, so don't give up on fiber altogether. Some processed foods add chicory root and inulin to boost fiber content, and these are hard for some systems to digest. A 2010 study published in the Journal of the American Dietetic Association found that although these fibers are well-tolerated by most people in moderate doses, larger doses can sometimes cause gas and bloating. Stick to naturally occurring fiber that you get from fresh vegetables, fruits and some whole grains. If you feel your fiber intake is woefully low, gradually increase it over the course of several weeks to prevent digestive distress. For a quick reduction in water weight, consider cutting back on the carbohydrates you consume daily. Don't eliminate all of them, as they're an important source of energy, fiber and nutrients, but stick to whole versions found in vegetables, fruits and small servings of whole grains. Ditch the refined ones that come in white bread, pasta, white rice and commercial pizza crust. When you eat carbohydrates, your body coverts them to glycogen to store in your muscles. Your body stores water to accompany this glycogen. If you cut back on the carbs you consume and reduce stored glycogen, you'll also release some of the stored water. This effect is temporary, however -- once you start eating carbs again, you'll gain water weight as you replenish your glycogen stores. Cutting back on carbohydrates suddenly can lead to a serious drop in performance as well; you use that glycogen to fuel workouts. Certain conditions -- such as celiac disease, in which your body has a serious reaction to gluten -- can cause bloating and require a doctor's intervention. IBS symptoms should be discussed with a doctor to see if any prescription medication can help. Some cancers, an overgrowth of bacteria in the small intestine, an imbalance of gut microorganisms and even certain lumbar spine curves can all show up as bloating. A health care practitioner can rule out serious causes of regular bloating and water retention as well as offer solutions such as probiotics or over-the-counter medications that may help relieve discomfort and distension. American Journal of Gastroenterology: Physical Activity and Intestinal Gas Clearance in Patients With Bloating. Daily Mail: Do You Suffer From Bloating and Gut Problems?